It is traditional in Ashkenazi Jewish homes to eat gefilte fish as a first course for Shabbat and most other holidays, including Passover. While it may be heresy, I never was a huge fan of this dish, even when I had it homemade rather than from a jar. Gefilte literally means “stuffed.” The fish mixture was stuffed back into the skin of the whole fish. It was a great way for thrifty – and often poor – families to enjoy this delicacy. Because the fish was mixed with other inexpensive ingredients like onions and eggs, a little bit of fish could feed an entire family. It later became popular to make the equivalent of individual fish quenelles. So although the fish was no longer stuffed, the name stuck. For several years now, I have made Egyptian Fish Balls in a savory tomato sauce. This year, however, I am making both! The Sephardic fish balls for the first Seder and the gefilte fish loaf for the second Seder. My recipe comes from two wonderful cookbooks: The Gefilte Manifesto by Jeffrey Yoskowitz and Liz Alpern and The New Jewish Holiday Cookbook by Gloria Kaufer Greene. As long as you start out with good quality, fresh fish, you can’t go wrong with either of these recipes. If you didn’t see this in time for the Seder, remember that there will always be Shabbat! Oil an 8 x 4-inch loaf pan. Line the bottom of the pan with a rectangle of waxed paper, cut to fit. Then oil the paper. Using the pepper strips and the carrot circles, create a simple and attractive design on top of the waxed paper in the prepared pan. The design will be inverted when the loaf is turned out of the pan. 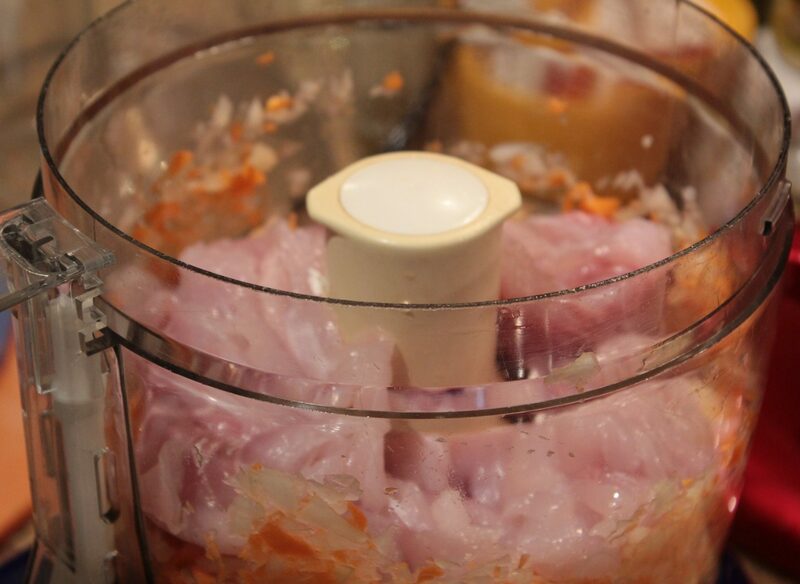 Use a food grinder or a food processor fitted with the steel blade to to chop the fish, onion and carrot until they are finely minced. 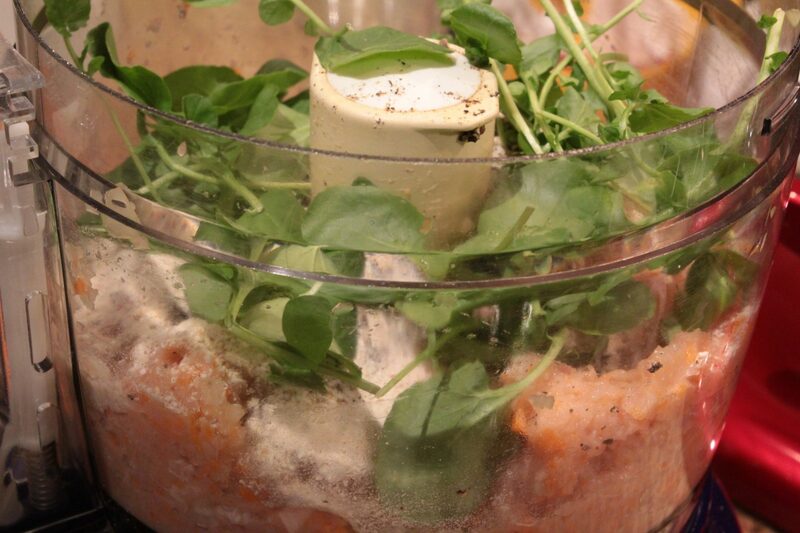 Add the egg, oil, water, matza meal, watercress or baby spinach, dill, salt and pepper. Process until everything is very well combined. Gently spoon some of the fish mixture around and over the decorative vegetables in the pan, being careful not to disturb the design. Using the back of a spoon or your hands, press the mixture into place, leaving no air spaces. Then add the remaining fish mixture to the pan, spreading it evenly. Cover the fish mixture with another rectangle of waxed paper that has been oiled on the side that will touch the fish. Bake the loaf for about 50 minutes or until firm. Remove the pan from the oven and allow it to rest for 10 minutes. Carefully peel off the waxed paper from the top of the loaf. Then run a knife around the sides of the loaf to loosen it. Invert the loaf onto a serving dish and lift off the pan. If the second piece of waxed paper is still attached to the loaf, carefully peel it off and throw it away. The loaf can be served warm, at room temperature or chilled. Cut into 1-inch thick slices. Serve with prepared horseradish or wasabi sauce. As someone who has hosted Thanksgiving dinners for over three (YIKES!) decades, I can tell you that in order to be successful and to also enjoy yourself, it takes a battle plan. You don’t have to be like me and start dreaming about what you will make six months in advance, but it makes all of the difference in the world if you are organized and plan to have a menu that mixes do-ahead dishes along with make-the-day-of dishes. It is the only thing that keeps you sane and relaxed, particularly if, like me, you have a small kitchen and limited storage. Everyone who comes to my house has their favorite dishes and I do try to always have some if not all of them on hand. I can’t even imagine having a Thanksgiving dinner that didn’t include my Curried Butternut Squash Soup, Orange Cranberry Relish or Vegan Pumpkin Pie and, of course, my Bourbon Pecan Pie. However, I don’t want to get bored and this year I am not only hosting Thanksgiving dinner for the family, but the Shabbat dinner the next night. So I make a point of slipping in something new every year. One thing I have learned over the years is that no matter what mistakes you may make in the main part of the meal, all will be forgiven – and forgotten – if you have great desserts. So in addition to the pumpkin and pecan pie, I will have an Apple Almond Paste Tart and this Apple Bourbon Bundt Cake that I am trying out this year. Sounds like a lot? I guarantee that with 13 people over two nights, there won’t be a crumb left! The beauty of this apple cake is that it is best made at least one to two days ahead. That allows the Bourbon, sugar, lemon glaze to really penetrate the cake and it will bring out the apple, ginger and spice flavors. And while I may be using some of those same flavors in other desserts, they appear in different guises with a different emphasis in each case. By using a palate of ingredients, you guarantee that everything will complement everything else. You don’t have to wait for Thanksgiving to make this lovely cake, but definitely keep it in mind for the holiday. It takes a little work but there are no special or difficult techniques involved. Just follow the steps and even a novice baker can have success. Heat the oven to 325 degrees. Grease and flour a 12-cup bundt pan. (Or use one of those cooking sprays that already has the flour in it.) In a small bowl, combine 3 tablespoons bourbon and the candied ginger. Let stand 10 minutes. In the bowl of an electric mixer fitted with the paddle attachment, beat together the brown sugar and remaining butter on medium-high speed, until light and fluffy, about 5 minutes. Beat in the eggs, 1 at a time, until incorporated. In a separate bowl, whisk together the remaining flour with the baking powder, baking soda, cinnamon, salt and nutmeg. In a separate bowl, whisk together the sour cream and vanilla. Pour in the bourbon from the ginger mixture (reserve ginger) and whisk until smooth. Stir in zest. With the mixer on medium speed, add the dry mixture and sour cream mixture to the wet mixture in three additions, alternating between the two. Fold in the ginger, apples and pecans. Scrape the batter into the prepared pan. Bake until the cake is golden brown and a skewer inserted into the cake comes out dry, about 1 hour 10 minutes. Cool in the pan 20 minutes, then run a paring knife around the sides of the pan to release the cake, if necessary; cool, flat side down, on a wire rack. While the cake cools, make 10 slits on top with a paring knife and pour half the Bourbon-sugar mixture on the still-warm cake. When the cake is fully cool, flip it and pour the rest of the glaze on the other side, then flip again to serve. NOTE: While the cake is wonderful on its own, adding a good dollop of freshly made whipped cream or vanilla ice cream makes it amazing. Did I mention that you could even add a bit of Bourbon to the whipped cream?? * To toast the pecans (or any nuts), preheat the oven to 325 degrees F. Lay the nuts on a baking sheet or pan in a single layer. Toast in the oven for 10 to 15 minutes, depending on the nut used. You should just begin to smell the nuttiness. You should check the nuts about halfway through and jiggle the pan a bit. I am a true advocate for eating bread. There is nothing that beats the aroma or taste of bread that has just come from the oven. The entire house just smells delicious and warm and safe. As soon as the temperature outside begins to cool down, I turn my thoughts to cooking big pots of soup, stews and fragrant bean dishes. I love to make these things and to eat them. And best of all, they only improve with rewarming so that I always make enough for left-overs during the week ahead. This relatively simple but hearty fare really only needs some good bread to soak up the pot liquor and to fill my home with the most wonderful smells. I own several books on artisan bread baking but a book that I often return to is a slim volume called Betty Crocker’s Breads. I have owned this cookbook for decades and it is completely unpretentious with zero snob appeal. It also is entirely accessible and when the simple instructions are followed, the result is always a perfect loaf of bread. This is a perfect book for the novice or anyone who wants to bake without intimidation. Unfortunately, it appears to be out of print with only ridiculously priced copies available online. However, if you manage to come across a copy in a used bookstore – grab it! Try this bread for a family Sunday supper or surprise your guests for Thanksgiving. No one has to know how easy it is to make. Dissolve yeast in warm water in the bowl of a large standing mixer with the dough hook attachment. Add soup mix and stir to dissolve. Add the sugar, molasses, salt, egg, shortening, fried onions (if used) and 3 cups of the flour. Beat for about 1 minute on the lowest speed, scraping down where necessary in order to mix. Add 3 cups more of flour. Increase the speed to 2 (or the next lowest speed up) and continue beating with the dough hook, scraping down the dough as necessary, for about 7 to 8 minutes more. I did not require any additional flour, but if your dough seems too sticky, add up to another 1/2 cup, a Tablespoon at a time until the dough no longer sticks. The dough should be gathering up on the dough hook and will be smooth and supple (elastic) to the touch. [You can, of course, make this by hand, in which case you will have to knead the dough for 10 to 12 minutes.] Turn the dough into a greased bowl and roll it around to cover all of the surfaces. Cover the dough and allow it to rise until doubled in a warm, draft-free spot. (I use my oven, turned off, of course.) This takes just about an hour. The dough is ready if an indentation made with two fingers remains. Punch down the dough and divide it in half. Roll each half into a rectangles that is 24 x 5 inches. Tightly roll up each rectangle (I do them one at a time.) from the long side. You want to end up with a long, even log. Grease two 8-inch cake or pie pans. Beginning at the outside edge of the inside of the pan with the seam facing down, coil the rope of dough ending in the center of the pan. Brush each coil with melted butter. Allow to rise uncovered on a draft-free counter for 50 minutes or until doubled. Preheat your oven to 375 degrees F. while the dough rises to ensure a nicely heated oven. At the end of the rising, bake the turbans for about 40 minutes or until they are well-browned and sound hollow when rapped with your knuckles or a wooden spoon. Remove the breads from the pans to a cooling rack and brush with additional melted butter if desired. I LOVE Passover. I love that it means Spring is here. I love the story of my People’s deliverance from slavery to freedom. I love sharing our table with family and friends and I love the food. Baking for Passover was always challenging but not insurmountable and I make wonderful cookies and cakes that would be delicious anytime, but which I save for Passover to keep them special. However, our godson is deathly allergic to eggs and THAT is a real challenge. Sephardic Jews i.e. Jews who originated from Spain, always considered legumes (pulses) and rice Kosher for Passover, but Ashkenazi Jews i.e. Jews from Eastern European traditions considered these foods forbidden. Thankfully in the last couple of years this has changed if you follow the Conservative or Reform Jewish traditions. Some Orthodox Jews now eat quinoa during Passover and others do not. Yes, it’s complicated, so before you get too excited about this cake, find out if your community’s traditions allow for the use of quinoa and aquafaba (the liquid from cooked chickpeas). Some allow one and not the other. I am not a rabbinic authority. However, if you follow Sephardic traditions or the Conservative or Reform movement then this cake may just be a revelation to those of you who cannot or do not eat eggs but wish to observe Passover traditions. I saw a recipe for Paula Shoyer’s Chocolate Quinoa Cake on the Food52 website and was intrigued. I wondered if I could take the recipe and “veganize” (is that a word?) it. I made the cake 3 times until I was able to get what I wanted. And unlike the original, I did not make this in a bundt pan but chose to make it as a layer cake. I then went on the hunt for a vegan Kosher for Passover option for a chocolate mousse and purchased a Passover chocolate spread. Just follow the steps and this works. There are no tricks or special skills required, but it does take some patience. Thankfully I worked out all of the kinks for you. I made the cake layers a few days ahead of when I needed them but I didn’t assemble the cake until the morning of the Seder. Please use only the best baking chocolate and cocoa. There are many excellent Kosher chocolate options available now. I used a 70% cacao chocolate from Elite but there are others. I wouldn’t go below 60% cacao or above 70% for best results. Assuming you have any left-overs, they will last refrigerated for several days. This can easily be made a couple of days ahead. I wish that I could have had this recipe ready sooner, but keep this in your file for next year and/or make it during one of the remaining nights of Passover. Why do you think there are 8 days in which to celebrate?! Preheat the oven to 350 degrees F. Grease 2 8-inch cake pans (preferably non-stick) and line the bottom with a round of parchment paper. Sprinkle with unsweetened cocoa powder. Set aside. Either use quinoa that has already been rinsed or rinse your quinoa. If you don’t, there can be a slightly bitter aftertaste. Place the quinoa and water in a small pot with a lid. Bring to a boil, turn the heat to simmer and cook covered for about 15 minutes or until all of the liquid is absorbed. Open the pot and allow the quinoa to cool. This can also be made a day ahead. Melt the chocolate in a microwave safe bowl. Microwave on high for 45 seconds. Give it a stir and then microwave for an additional 38 seconds. Set aside. Place the quinoa in the bowl of a food processor and process until the quinoa is broken down almost to a paste. Now add the sugar and pulse a few times. Add the zest, if using and coffee and pulse a couple of times. Add the cocoa powder and pulse about 5 times. Then add in the baking powder and salt and pulse twice. Add in the orange juice, melted chocolate and vanilla extract and pulse a few times. Now add the melted coconut oil and pulse until incorporated. Lastly add the matza cake meal and nut meal. Just leave everything in the food processor, covered while you prepare the aquafaba. 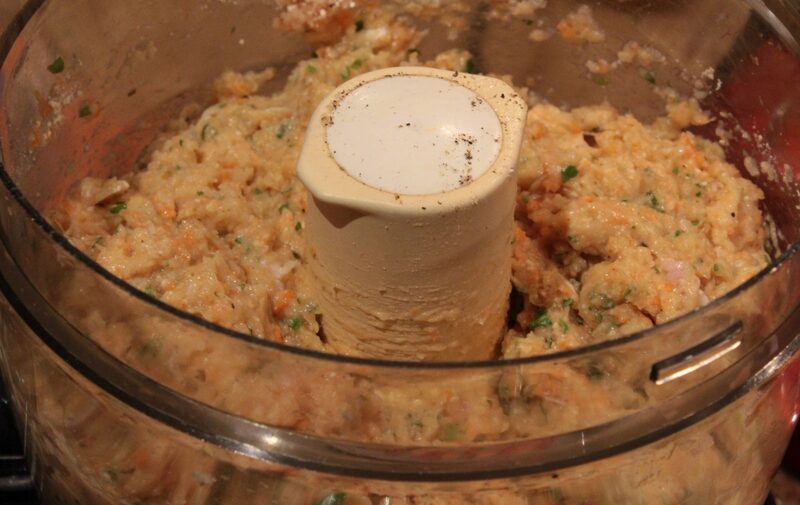 In the bowl of a standing mixer, add the strained liquid from a 15.5 ounce can of chickpeas. I like the ones that have salt. It just always seems to work better for me. Using the whisk attachment, beat the aquafaba on high until the liquid turns completely white, has increased in volume and begun to thicken. This takes about 15 minutes so be patient. You do not need to beat until actual peaks form. Add the aquafaba to your food processor and process until it is completely incorporated. This can be done by hand if your processor isn’t big enough. Divide and pour the mixture into the prepared pans and bake for about 40 minutes or until a toothpick inserted into the middle comes out with just a couple of crumbs on it. Remove the cake to a cooling rack and allow it to cool in the pan for about 12 minutes or until you can touch the rim of the pan with your fingers. Place a cooling rack over the pan and flip out the cake. Allow it to finish cooling completely. This can be made a couple of days ahead or even earlier if well-wrapped and frozen. If frozen, defrost the cake layers before assembling. In a small saucepan, combine cocoa or cacao powder, cocoa butter, chocolate, salt, and (180 ml) coconut milk. Begin warming over medium-low heat, whisking to combine. Once the mixture is melted whisk until fully combined. Then remove from heat and add vanilla and confectioner’s sugar to taste (or just add more dates). I found 3/4 teaspoon sugar to be perfect. Transfer the mixture to a blender. Add dates and blend on high until creamy and smooth. Taste and adjust flavor as needed, adding more cacao powder for rich chocolate flavor, dates for sweetness, or salt for saltiness. Transfer to a bowl and cover. Refrigerate until cold and thickened – at least 4 hours, preferably overnight. To serve on its own, divide between serving glasses and top with coconut whipped cream, raspberries, and chopped vegan dark chocolate or cacao/cocoa powder (optional). Store leftovers covered in the refrigerator up to 5 days. Place one cake layer on a cake plate or cake board with the flat side facing up. (The flat side will have sunk slightly as it cooled but don’t worry since it will be filled with mousse and won’t show.) Spread with softened chocolate or chocolate hazelnut spread. How thickly you do this is between you and your cardiologist. I used about 10 ounces. Now spread half of the chocolate mousse over the chocolate spread. If you like, you can sprinkle about 2 Tablespoons of shopped walnuts and 2 Tablespoons of mini-dark chocolate chips over the chocolate spread for a bit of extra decadence. Place the next layer with the flat side facing up over the first layer and the fillings. Cover the top of the cake with the remaining mousse. Using an off-set spatula, just smooth around the sides of the cake to catch any bits that may have oozed. You should see the filling, but it shouldn’t be oozing out. You need to refrigerate the cake at this point to keep things from softening and to make cutting the cake easier. Add chocolate curls or sprinkles or piece of candied orange to the top if you wish but frankly nothing more is needed. Take the cake out of the fridge about an 45 minutes to an hour before you wish to serve it. This incredibly rich and decadent cake reminds me of a Chocolate Marquise cake that a wonderful French Bistro in Chicago used to make. No one eating this will think that they settled either for a Passover dessert or for a vegan dessert. This is one INTENSE chocolate experience. I grew up with a mother who cooked and baked and while we did, of course, buy things from a wonderful neighborhood bakery, there was nothing like walking into a house with that smell of fresh baking. I wanted my son to have this experience as well and so even though I volunteered and went back to graduate school and then eventually worked full-time while he was growing up, I still tried to bake as often as possible. When I had time, I might make something more difficult but I always had some easy recipes up my sleeves for those days when time was at a premium. Since both my husband and son were – and still are – such appreciative audiences, it was a pleasure to make this extra effort. I found this recipe in a wonderful cookbook that I have gone back to over and over again and it was one of my first gifts to Frances and Matthew when they had their own apartment. Not only are the recipes incredibly accurate and easy to follow, but the stories that go along with the recipes are fun – and often enlightening – to read. This is a great cake to make any time but is a wonderful last minute dessert for Shabbat. You could also prepare the topping (except for the apples) the night before along with measuring out your dry ingredients. It will be a snap to throw this together before dinner. Left-overs are great the next day with a cup of coffee, tea or milk. Spiced Apple Cake by Gloria Kaufer Greene from The New Jewish Holiday Cookbook. 1 large or 2 small/medium sweet baking apple(s), like a Golden Delicious, peeled, cored and thinly sliced. Squeeze a few drops of fresh lemon juice over the apples to keep them from darkening. Preheat the oven to 375 degrees F. Grease or spray a 9-inch (preferably non-stick) square baking pan. In a small bowl, mix together the dry ingredients for the topping. I found that throwing the spices, sugar and nuts into a blender and pulsing the mixture to chop the nuts makes fast work of this. Set the mixture and the apple slices aside. This can be done by hand but I find it makes for a lighter batter if I use an electric mixer. Cream the butter and 3/4 cups of sugar until light and fluffy. Beat in the eggs. one at a time and stir until well-combined. Add the spices and beat well. In a medium bowl, mix the flour with the baking soda, baking powder and 1/4 teaspoon of salt. Alternately add the cider and flour mixture to the batter, beating well after each addition. Pour half of the batter into the prepared pan. Sprinkle the batter with half of the nut topping. Arrange all of the apples over the topping. Spread the remaining batter carefully over the apples and sprinkle the remaining topping over the batter. Gently press the nut topping into the batter with your fingertips. Bake the cake for about 35 minutes or until a toothpick inserted into the middle comes out clean. Cool in the pan on a wire cooling rack. Cut into large squares. This can be eaten still warm, but not hot. Cover any left-overs with foil. For extra decadence, serve with a scoop of vanilla ice cream or freshly whipped cream. One of the many joys of attending a Shabbat morning service is the Oneg Shabbat that follows (literally “Sabbath delight”). This can be as small as a few cookies or slices of poppy seed cake or can encompass an entire luncheon. There are usually songs and blessings and sometimes a lecture or discussion as well. It’s a nice time to catch up with people and it’s especially nice if you attended an entire service, which in the Conservative and Orthodox traditions will have lasted for several hours. My personal favorite of all the possible Oneg offerings, though, is a really good chocolate babka or krantz cake. This is a yeast cake with swirls and swirls of chocolate running through it. There is nothing like eating it still warm from the oven when the chocolate is a bit oozy, but since observant Jews do not do any cooking on the Sabbath, it is usually eaten at room temperature. This is a cake that takes some time to make and involves a number of steps. If I were living in Israel – or in a community with a really good Kosher bakery – I probably would simply go out and buy my babka. But since I live in downtown Chicago and my current synagogue doesn’t go in for this treat, I have to make it myself if I am going to indulge in all of its chocolaty, yeasty goodness. I originally made the version by Yotam Ottolenghi in his cookbook Jerusalem. I thought this time I might try a different recipe that I found online for a Nutella Babka. It killed me to do it, but the dough got thrown out. I just knew that it was simply NEVER going to rise. It was like lead. So I went back to Ottolenghi. I made just a couple of adjustments, including adding a chocolate hazelnut spread which caught my eye in the other recipe. If you don’t mind a bit of a project, this is really worth making. Otherwise, get yourself to synagogue and hope for a great Oneg! Make the dough: Combine the flour, sugar, yeast and zest in the bottom of the bowl of a stand mixer. Add eggs and 1/2 cup water, mixing with the dough hook on low speed until it comes together; this may take a couple of minutes. With the mixer on low, add the salt, then the butter, a bit at a time, mixing until it’s incorporated into the dough. Then, mix on medium speed for 10 minutes until dough is completely smooth; you might need to scrape the bowl down a few times. I added a Tablespoon or 2 of flour to the sides of the bowl to make sure that all of the dough came together and pulled away from the sides. Assemble loaves: Coat two 9-by-5-inch loaf pans with oil or butter, and line the bottom of each with a rectangle of parchment paper, which is also then oiled. Take half of the dough, leaving the other half chilled. Roll out on a lightly floured counter to about a 10 by 15 inches. The long side should be facing you. Trim the dough to be an even rectangle. Spread half of the hazelnut chocolate spread evenly over the dough, leaving about a 1/2-inch border all around. Scatter half of the chocolate chips over the spread. Brush the end farthest away from you with tap water. Roll the dough up tightly with the filling into a long, tight cigar. Trim the last 1/2-inch off each end of log so that they are even. Using a serrated knife, gently cut the log in half lengthwise and lay the strips next to each other on the counter, cut sides up. Pinch the top ends gently together. Lift one side over the next, forming a twist and trying to keep the cut sides facing out (because they’re pretty). Don’t worry if this step makes a mess, just transfer the twist as best as you can into the prepared loaf pan folding extra underneath to fit. Repeat process with second loaf. Cover with a damp tea towel and leave to rise another 1.5 hours at warm room temperature. Since I tend to keep my house on the cool side, I heated my oven to the lowest setting (in my case, 170 degrees F.) and when the oven came to temperature I turned it off, while I finished forming the second loaf. I then placed the loaves in the warm oven to rise for 1 hour. After an hour, I removed the loaves to the counter to preheat the oven for baking. Bake and finish cakes: Heat oven to 375°F (190°C). Remove towels, place each loaf on the middle rack of your oven. Bake for 30 minutes or until a toothpick inserted into the dough comes out clean. Because of all of the chocolate, this is not a perfect process so also use your nose and eyes to tell if the babka is fully baked. If your babka needs more time, put it back, 5 minutes at a time then re-test. If it browns too quickly, you can cover it with foil. Preparing the syrup: While babkas are baking, make the syrup. Bring sugar and water to a boil and mix until the sugar dissolves. Remove from the heat and set aside to cool somewhat. As soon as the babkas leave the oven, brush ALL of the syrup over each loaf. It will seem like too much, but it will all absorb into the warm loaf and will leave the babka glossy and moist. Let the loaves cool in their pans until just warm and then transfer the loaves to a cooling rack to cool the rest of the way before eating (this is a suggestion from Ottolenghi but I defy you to not eat it when it is still warm!) Cut with a serrated bread knife and prepare to be amazed. Do ahead: Babkas keep for a few days at room temperature. They also freeze well. I was going through some old recipes and came across this one on a sheet of yellowing newsprint. It was from a December 1991 New York Times Magazine. The article was titled “True Confections.” The one that caught my eye and which seems perfect for Valentine’s Day is by Dorie Greenspan from her cookbook Sweet Times. Nothing says Valentine’s Day like chocolate, and this one is ready to eat in about an hour. Of course you don’t have to wait for Valentine’s Day to serve this little slice of chocolate heaven. Butter an 8-inch round cake pan and line the bottom with waxed paper. Butter that and dust the inside of the pan with flour, tapping out any excess. Alternatively use one of the baking sprays with flour. Melt the chocolates over a double boiler set over hot water or in the microwave and set aside. Place the amaretti cookies and almonds in a food processor and pulse until the mixture is evenly ground. Set aside. Place the butter, sugar, salt and eggs in the food processor bowl and process until the mixture is satiny smooth – about 3 minutes. Scrape the bowl as necessary. Now add the amaretti/almond powder and the melted chocolate. Pulse to combine well. Turn the batter into the prepared pan and bake in the oven on the center rack for 25 to 30 minutes. The top will look baked and perhaps a little cracked and the center will still be moist. Cool on a rack for 30 minutes. Then run a thin metal spatula or blunt knife around the edge of the pan and carefully turn out the torte. I place a cutting board over the pan and turn it out onto that. The cake is too soft and moist to turn out onto a cooling rack. The indentations will eat right into the cake. You could also use a large plate but I find that the flat cutting board works best. Then peel off the waxed paper and invert the torte onto a serving dish. I do this by placing the serving dish over the torte and then carefully flipping the serving dish over while holding onto the cutting board. Dust with confectioner’s sugar or cocoa. Serve at room temperature with a little vanilla ice cream or freshly whipped cream. .
My niece and nephew and I divide all of the Jewish holiday celebration dinners and since most holidays are over multiple days, this makes hosting more manageable, especially since we all live in apartments with limited space. For Rosh HaShana I agreed to host the first night and my niece and nephew did the second night. They wanted to make brisket (which was wonderful) and so I happily decided on lamb for my dinner. In keeping with my love of most things Indian, I decided to make lamb biryani as a main course along with a delicious lentil dal. Jews were living in India since at least the 12th century as reported by a Spanish traveler, Benjamin Tudela. The Jews he came across were in Cochin, and were one of three Jewish groups living in that southwest city on the Arabian Sea. Known as “Black” Jews, they lived in a joint family system, much like conservative Hindu families, that was seen as a way to protect the very young and very old. For more on Cochin Jews check out this article in Wikipedia or on My Jewish Learning. Koli Soup was often made for Shabbat and while not spicy hot or particularly exotic looking, it is quite aromatic and seasoned in a way that is surprising to Western tastes. My sister, who professes to not like Indian or spicy food, nevertheless loved this soup. Bring the water to a boil in a pot that is large enough to hold everything. Add the chicken and simmer covered for 30 minutes. Skim off the scum that rises to the top before covering. After 30 minutes, add all of the other ingredients and cook, covered on low heat for 45 minutes. Allow the soup to cool. The soup can be made ahead up to this point and gently reheated when you are ready to serve. When the soup is cool enough to handle, remove the chicken and take the meat off of the bones, discarding the skin and bones. Return the meat to the pot. When ready to serve, reheat the soup and either add the parsley and cilantro to the pot or garnish each bowl with the fresh herbs as you ladle it out.